Lilly Schwartz is a photographer based in San Sebastian, Spain, who loves shooting street. Her documentary photographs resonate with powerful feelings about places and events, quite palpable to the viewer of the images, but they also have a meditative quality - a stillness. Her street photographs feel more seized than taken. They show a moment - a moment of emotion or a moment of style - and while they focus quite closely on a person or people they also give the person or people some local context, and this turns a moment into a story. Hi Lilly! Where does your interest in photography come from? Frankly, it's hard to pinpoint now, because I've been doing it for so long. I think it might have a lot to do with my mum working in the library of the local art museum though. Thanks to this I was constantly around art as a kid and I guess I must have felt inspired to create something myself. Cameras always seemed more manageable to me than pencils or paintbrushes, especially since I didn't have to use them for schoolwork either. What kind of photographs do you mostly make, and what camera and kit are you likely to have with you? I passionately shoot street and do the occasional documentary project on the side. In 35mm I shoot different rangefinders depending on the situation. When I have time, I shoot a fully manual one like the Zorki 4K, but when I'm just shooting on the side I prefer my Olympus XA, because it's so small and easy to use. For medium format I have a Rolleicord V which is probably my favourite camera. The image quality is simply amazing! I guess my preferences will change very soon though because I just took the plunge and got myself a Leica M6. How important is the place where you live to your street work? Do you think you can do street anywhere? I think the place is very important. I recently moved from a capital city to a small beach town and it's really a lot more difficult. I do have to walk a lot more for my shots and frankly the people and interactions are often less interesting. It's not impossible, but a lot harder. As they say though, we grow by challenging ourselves! Tell me about one documentary project that you're really proud of. I just finished my Progress Through Demolition project after struggling with it for many years. 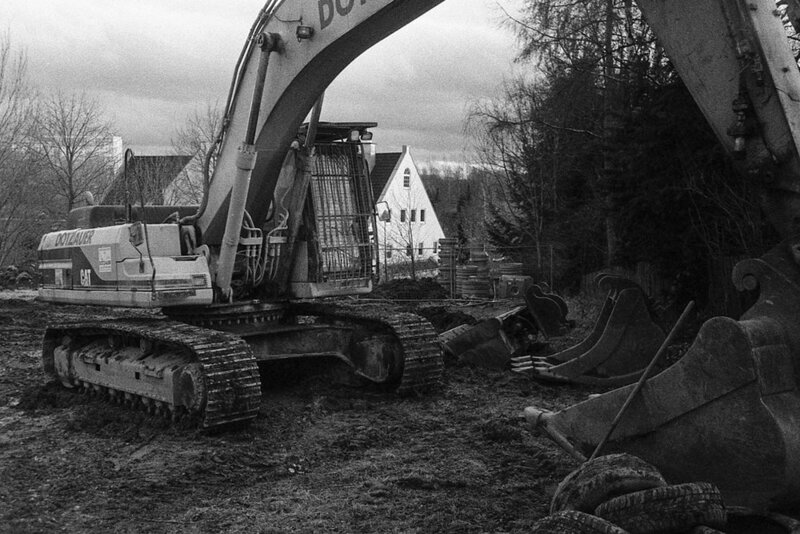 The project is about my hometown which fell onto hard times after the German reunification. For some time there was no work and so many people moved away that parts of the town are now almost deserted. The city responded with a policy sarcastically called Fortschritt durch Rückbau - Progress Through Demolition - and tore down many of the old socialist blocks as well as a lot of the empty schools and kindergartens. The house where we lived, my kindergarten, my primary school and my secondary school were all torn down and in their place are now parking garages or empty lawns. At the same time attempts at reviving some of the remaining deserted neighbourhoods were unsuccessful and left behind an even more post-apocalyptic scenery. For me it was a very personal project with rather difficult parameters, precisely because many times it involved capturing something that literally wasn't there anymore. In the end I pushed through the difficulties and managed to capture something quite universal that happened all over East Germany after the reunification. Progress Through Demolition sounds a bit Kraft Durch Freude, is that what you meant by the 'sarcastic' naming of the policy? That it referred to other ehm... famous social programs? This is exactly what I meant. Calling a demolition campaign "progress" is quite brazen propaganda in the best German tradition. Even the word "Rückbau" is a euphemism for which there is no real translation. It literally means "building backwards". Do you think of yourself as a documentary photographer? Is that a different being from an art photographer or is it an unuseful distinction? Yes, I definitely see myself as a documentary photographer. However, I believe that the documentary genre definitely has scope and need for a subjective interpretation. I aim to document as faithfully as possible under any given circumstances, but I am also very aware that objectivity is not only impossible but also not always desirable. Often a subjective interpretation offers a more faithful representation of what life is like for some people rather than any failed attempt at objectivity that remains faceless and arbitrary. After all, my interpretation of the outcome of the Progress through Demolition policy depends highly on the fact that I myself grew up in and around the buildings that were demolished. The gap between such more subjective documentary photography and conceptual art photography is actually not that wide. The only real difference is that I as a documentary photographer will present an interpretation of a reality that is already there, while an art photographer is more likely to try to force fiction into the shape of reality. Where are you going with your work? Do you plan your future or simply move forward? I don't particularly enjoy planning and think that drawing up elaborate schemes is just another form of procrastination. It seems to me that the best things usually happen in an entirely unplanned or even random fashion and street photography especially is very dependent on serendipity. However, some of my projects do involve a substantial amount of travel or require new gear, training or even to learn a new language, and even projects that don't pose immediate obstacles do profit from at least a minimum amount of forethought. I learned that by being forced to shoot an important project with a camera that is sensitive to cold in -5°C weather! Other than in such situations, I often just go with the flow and hope for the best. My street photography is almost entirely unplanned. In those cases where I do have plans they never go beyond my most immediate long-term projects, which currently involve a couple of book projects, some more documentary projects as well as collaborations with other photographers from our newly founded street photography collective Temp. And finally, why did you decide to join She Shoots Film? For a while now I have felt that women in photography lack a voice. I feel that our male colleagues are much more vocal about their work simply due to a lack of an appropriate space or context where women don't feel intimidated or pushed into the background. Especially in the online community surrounding film photography women often only feature as subject matter and sometimes are even portrayed in such a way that it might actually be offensive to some women. Of course the film photography community shouldn't be reduced to gender issues and I definitely found a lot of supportive and helpful friends of all genders there, but I have to say that I regularly see pictures in different Facebook groups that make me cringe if I look at them from that "female perspective". I have also heard from several women that they don't feel like contributing to groups that accept such pictures without even a hint of controversy. In one of the groups where this regularly happens a woman actually voiced an objection to this situation and was immediately attacked in a rather vicious and outright insulting way. And even among the more moderate comments the most common reaction was one of belittling the problem or denying its existence altogether. I definitely wouldn't want to characterise the problem as one of open misogyny, definitely not, but it almost seems as if a considerable number of people - also women - in the community like to pretend that gender issues are a thing of the past. Sorry to disappoint, but as long as I regularly see pictures of barely dressed women with their head in the garbage bin, posed as corpses or having a gun pointed at them I think we still have a problem! And simply closing our eyes to it won't make it go away either. Although women have of course an opportunity and maybe a responsibility to attempt to change the dynamics of the community we clearly have a long way to go before we can feel entirely comfortable showing our work in such a context, especially if objections to this situation are met with such hostility. When you asked me for this interview you told me a little bit about what Aliki and you were planning to do with She Shoots Film. It definitely resonated with how I feel about the role of women in film photography and this is why I wanted to join you girls. I really think this is an important issue and I believe that with my contribution to She Shoots Film I can try to change something that only made me feel helpless before. And even if change is always difficult and might take a long time to take effect, in the meantime we can already offer a different context for women to show their work and provide a female viewpoint that I feel is lacking in the film photography community at the moment. For more information on Lilly's work, please visit her website.